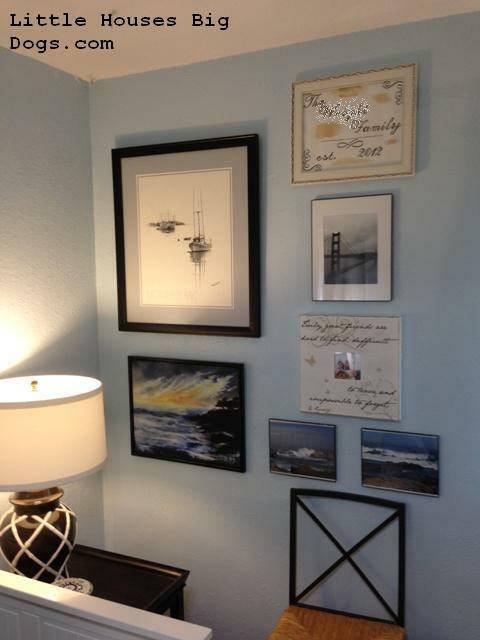 What is a “Dream Wall?” DIYers have heard of a dream board or inspiration board. We clog up our Pinterest pages full of ideas and inspiration for the next project or post them on a blog. However we should all seriously consider creating our own “Dream Wall.” Where one wall of your home is used to display art work and items that remind you of a goal or dream you want to attain someday. Visualizing goals are so important to making a dream a reality. Essentially a “Dream Wall” is like taping a 3×5 index card to your bathroom mirror with your goals, except a lot more stylish! Here is mine, can you take a guess on what my goal and dream might be? I’ve been collecting and photographing beach prints and photos for years with the hope of someday owning a little piece of the [expensive] California coast. A place our friends and family can use, and the dogs can chase seagulls on th beach. This Dream Wall, prominently displayed in my home office is a reminder every time we work on the budget, write, or plan the next DIY project. It is a fabulous way to keep you grounded and inspire you at the same time. What does your “Dream Wall” look like?